Ligamentum flavum are the ligaments present in spine. These ligaments connects the vertebral column together. It is a Latin word means “yellow ligament”. Ligamentum flavum hypertrophy is also known as ligamentum flavum thickening. It is a degenerative disease which involves the compression of nerves. In this condition, the ligament attaching vertebrae together is stretched and bended and do not come to its original position even after relaxing. When the ligament stretch, it impinges and covers the side space available and ultimately leads to the narrowing of already present spinal spaces. When the front canal gets thicken along with this condition, it may lead to spinal stenosis. not easy for patient. If there is any kind of injury in the spinal area, then pain get more worse than before sometimes unbearable for patient. The person having abnormality in the spinal cord are more susceptible to ligamentum flavum hypertrophy. Injury or trauma to spinal cord area causing abnormality to spinal cord. This condition is also associated with age factor, as increased age makes the tissues less strong and less functional. Many of the cases reported are without any cause. Arthritis and herniated disc can also be the cause behind this condition. If no cause is found behind this condition then it is known as idiopathic LFH. The diagnosis is done by two methods reported and these are computed tomography and magnetic resonance imaging. The MRI is considered more efficient and used more as compare to CT scan. With MRI the condition can be verified by comparing the defected and normal ligaments present at the site. But there are some restrictions associated with these two techniques as they cannot be performed on a patient already having osteoporosis, claustrophobia, collapse of disk at different places, spinal stenosis, increased fatty mass i.e. obesity and any kind of defect in spine. First of all, the pain associated with this condition is treated with NSAIDS to comfort the patient. Physical therapy is also required to position the ligament on its original place. If all this therapy is not effective then a surgery is recommended for patient as permanent solution. During surgery, a very small cut is made at the back side and then instruments are entered into the body through this incision and correct the abnormality present. 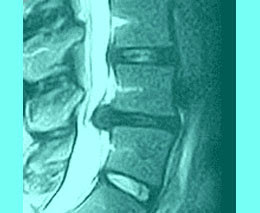 A complicated procedure is also used as treatment known as laminectomy and a long term recovery is associated with it.